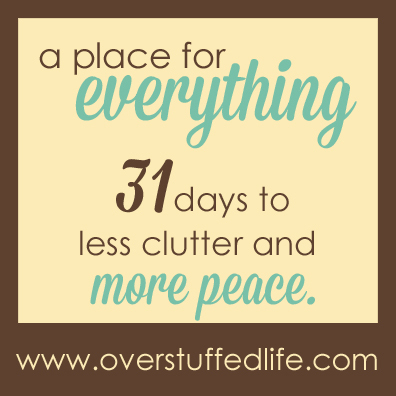 Now that we've gotten rid of some of the clutter, it's time to deal with everything you put into your "keep" pile. All of those items we need, use, and/or love. You're going to find a permanent place for everything. And I do mean everything. If you don't designate a place, that item will quickly become clutter again. 1. Decide where the most logical home is for each item. Where do I use this item most? Do I use other items along with it? Where would be the most convenient place for this item to live? Ideally, things should live in the same area where they are most often used. I'm not going to store my pots and pans in my bedroom, because I need them in the kitchen! If I did store them in the bedroom, they would probably not be in their designated spot very often because it would be too annoying (and I would be too lazy!) to constantly put them back in such an illogical location. If it is an item that isn't used very often, it's okay not to store it where you most use it if you don't have space for it there. Beware that you might forget about it completely, though! I've certainly done that plenty of times. 2. Use what you already have. Is there an existing space that could hold this item? (Bookshelf, cupboard, drawer, bin, jar, bucket, basket, hook, etc.) Sometimes the fact that there is not already some sort of good storage place for things is our biggest hindrance to finding homes for them. Be creative with what you already have. As much as I would love to run out and buy some wonderful new furniture or cute organizing bins, the point is to just get stuff organized and stored properly for now. We can make it look amazing later. 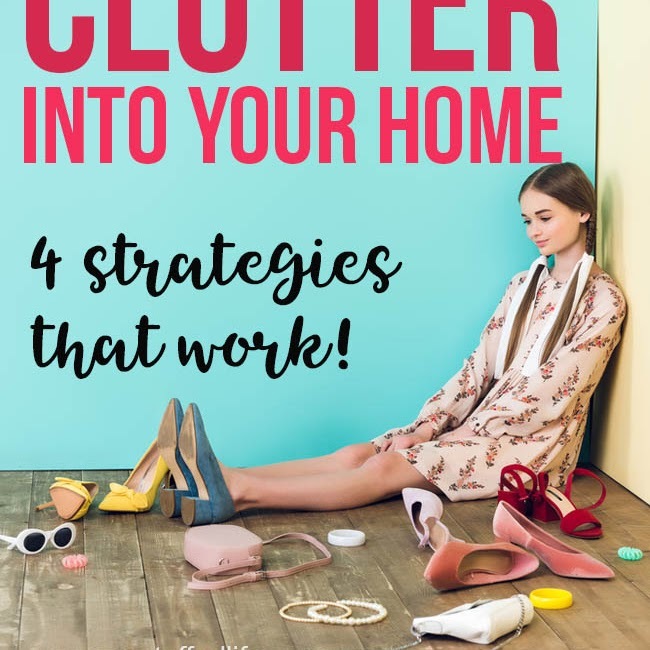 Plus, we don't want to bring in more clutter to store the clutter! Think about what kinds of bins and buckets and shelves you already have that might be used to store your items. If you really don't have anything (which I highly doubt! ), a walk through your local Goodwill can often yield some really good results. Or, you know, IKEA. That is, f you're lucky enough to actually have one you can just run to whenever you like. Here's a good example from my house. I've had these plastic bins for about 9 years. 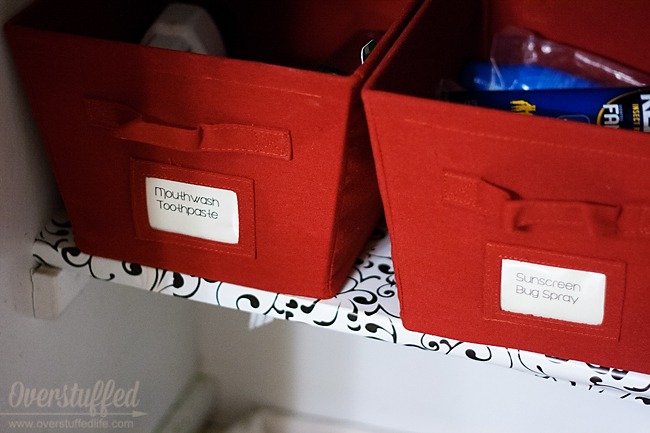 I used to use them to store food in my pantry (you can see what that looked like by clicking HERE). My current house has a teeny tiny pantry, though, and using the bins to organize it was no longer helpful because they didn't fit. I've found another good use for them, though. I used to have a huge problem with all the crayons and markers and scissors. Once the boxes died (which is pretty much immediately), they had no real home. I started throwing them in a drawer, but pretty soon it was completely overtaken and we started using another drawer! I finally dug out these bins, slapped labels on them, and sorted through the mess. And guess what? They stay where they are supposed to, for the most part. Occasionally there are stray markers and crayons that didn't get put away, but I've been impressed with the girls for mostly putting them back after they use them. While I admit that I am a crazy label making fool half of the time, it is SO important to label things. How else will your kids know where things go? How else will you know where things go? I adore my label maker. Mostly because it just plugs into my computer and I can have access to all of the million and one fonts I have there. It makes labeling just a little more fun. 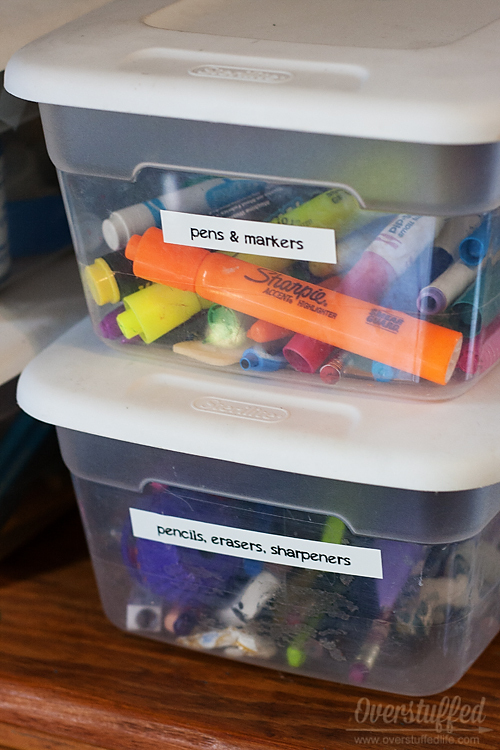 As much as I love my label maker, you don't actually need one to label things. And I often just hand write them. As long as things are labeled, it doesn't matter how you do it. Just get a label on it--I promise that you'll be really glad you did. The only warning I'd give with labels, is to really try to use a paper or sticker label. I used to just write directly on bins and things with a Sharpie, and as my storage needs changed, I always regretted doing that. 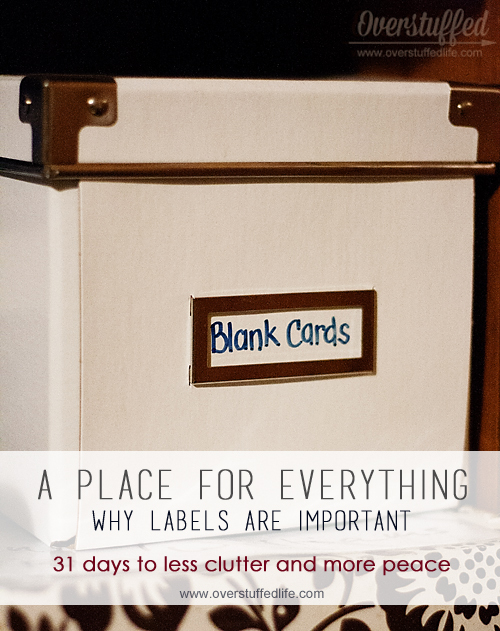 Find all of the posts in this 31 Day Challenge here: A Place for Everything: 31 Days to Less Clutter and More Peace.